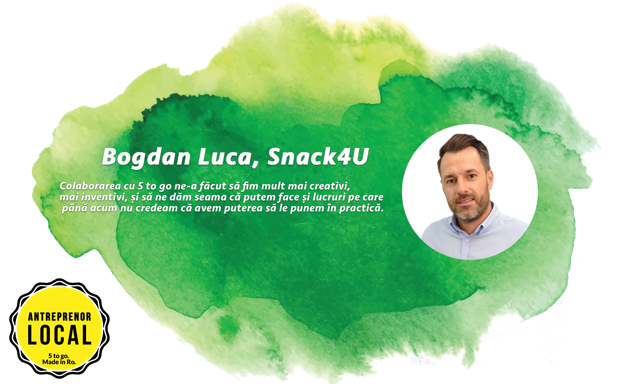 Bogdan Luca is a 40 years old entrepreneur and he has been holding a company founded with his brother, Marius – Snack4U, a 100% Romanian business, dedicated exclusively to the production and distribution of sandwiches, salads and soon soups. Bogdan and his brother have realized that there are vital principles in any field of activity whose foundation directly and definitively influences the evolution of the business. Due to its fairness and quality, Snack4U has become one of the leading market leaders, producing and distributing nationwide a portfolio of over 1,000 active customers. Thus, Bogdan’s company gained its place in the top three best sandwich makers in the country. For 5 to go, the company produces a wide range of sandwiches that, thanks to premium quality, quickly became the preferred choice of customers when they want a consistent and fast snack. And he succeeded. Among the main secrets that have helped to strengthen business, include highly specialized staff with sound professional training and efficient management. The 5 to go partnership started with a product presentation and everything went spontaneously. “I knew there someone who told me about 5 to go. A few days ago he introduced Lucian and from there everything was easy. When people are open and have ideas, beautiful things are born. Collaboration with 5 to go has been a challenge and we like the challenges! “He remembers. And as most of the businesses involve difficult moments, Bogdan and his team have armed with patience and willing to demonstrate that everything is possible when you approach things with professionalism. “It is not easy to build such a business with products that have a very short shelf life and to distribute them across the country. You must have a lot of patience, steel nerves, and think that once you start the story you can not stop “- Bogdan Luca, founder of Snack4U.